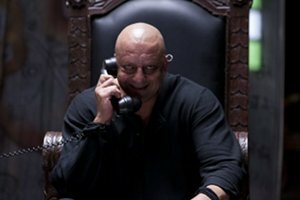 Sanjay Dutt’s Look in ‘Agneepath’ Revealed! Sanjay Dutt’s look in the film is quite shocking. His shaved head, waxed-off eyebrows, tattoos and bulked up physique is enough to make you do a double take! The creepy grin Dutt pulls off is just the icing on a really frightening cake. Agneepath is a remake of the 1990 Hindi film and reportedly different from the original. The original Agneepath, directed by Mukul Anand, starred Amitabh, Mithun Chakraborty, Madhavi, Rohini Hattangadi and Danny Denzongpa. It was produced by Yash Johar, Karan’s late father. The remake version of Agneepath will have Hritikh reprising Bachcan’s iconic role of Vijay Deenanath Chauhan while Priyanka Chopra will take the role of the female lead. The character written by Mithun Chakraborty has been totally done away in the remake and the role of the villain played by Danny Denzongpa is being essayed by Sanjay Dutt. Veteran actor Rishi Kapoor will play another negative character. The remake of Agneepath will hit cinemas on January 13th, 2012. We are nervous and excited to see what similar looks we will be seeing from Sanjay Dutt!